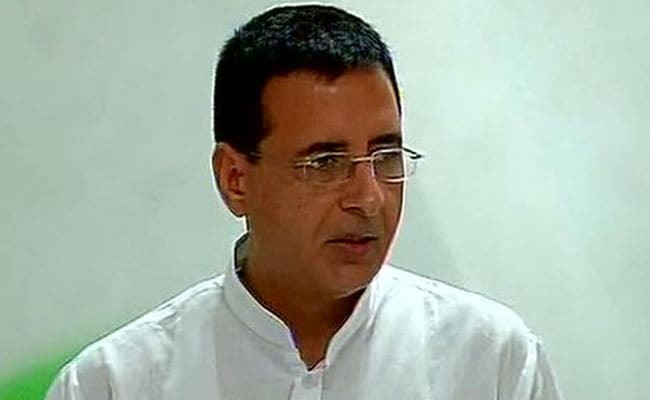 Congress's Randeep Surjewala Says Demonetisation "Biggest Scam In Independent India"
Congress Says Demonetisation "Biggest Scam In Independent India"
Addressing a press conference in Raipur in poll-bound Chhattisgarh, Mr Surjewala hit out at Prime Minister Narendra Modi for breaking his "silence" on the issue on its second anniversary. In a stinging attack on the demonetisation exercise, senior Congress leader Randeep Singh Surjewala today dubbed it as the "biggest scam in independent India" due to which citizens lost their lives, jobs and life-long savings. "The way he was praising demonetisation appeared as if it was 'andher nagri chaupat raja' (a confused ruler, a chaotic state)," he said, referring to a popular Hindi phrase. Singling out Congress chief Rahul Gandhi and his mother Sonia Gandhi, PM Modi, in a poll rally in Chhattisgarh, said yesterday that the "mother-son duo were out on bail" and hit out at them for questioning the government's demonetisation move. Without naming the Gandhis, he said "they should not forget" that it was due to the note ban move that they "had to seek bail". On November 8, 2016, PM Modi had announced a ban on then in use Rs 1,000 and Rs 500 denomination bank notes with immediate effect. Mr Surjewala claimed that around 120 people died waiting in bank queues for their money, while many lost their jobs and women had to forgo their life-long savings following note ban. "It is the biggest scam in independent India," he alleged. He claimed that demonetisation benefited those who had black money as they deposited it in banks. "Overnight, all the black money became white," the All India Congress Committee (AICC) spokesman said. Finance Minister Arun Jaitley had on the second anniversary of the note ban exercise on November 8 said that it had resulted in formalisation of economy and increased tax base, prompting the government to earmark more resources for the poor and infrastructure development. Mr Surjewala further slammed the Centre over the alleged Rafale scam and said, "Nation doesn't need doctored explanations but fair investigation." "(The) fixed match between BJP government and Dassault and the PR stunts of PM Modi and Eric Trappier can't hide the blatant corruption," he alleged. The first phase of polling in 18 out of the total 90 Assembly constituencies in Chhattisgarh was held yesterday. The other 72 seats will go to polls on November 20 and the counting of votes will be held on December 11.